Camp CDS is a fun-filled experience for young children. Since it was founded in 1964, NAEYC accredited Country Day School has dedicated itself to providing young children with wonderful opportunities to explore the outdoors, participate in creative and musical activities, and enjoy water play or swim lessons in a safe and child-centered environment. Camp is a relaxed time for exploration, self-expression and socialization in a variety of age-appropriate activities throughout our campus. The camp, staffed by experienced early childhood teachers and assisted by students, places children in small groups that ensures careful supervision as the children enjoy the best of summer. 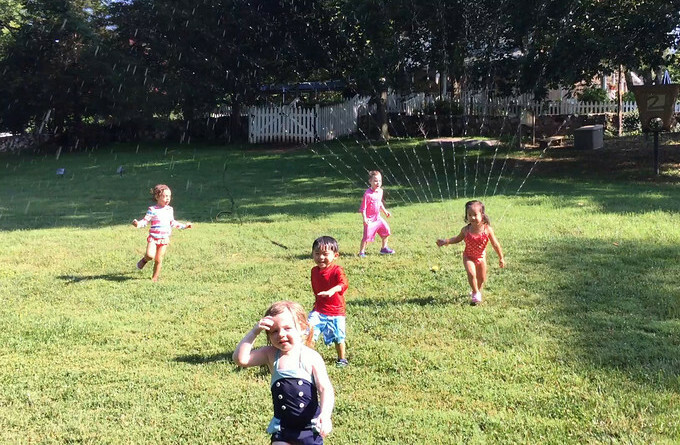 Country Day School sits on four beautiful acres in the heart of McLean and offers many ways for young children to enjoy the best of summer. The campus includes nine playgrounds with numerous climbing structures, swings, slides, playhouses, and sandboxes, open fields for games and running, a nature trail for exploring, a child sized outdoor stage for creative endeavors, and a heated swimming pool designed for instructing younger children. The program is designed to make the best use of our resources. Our playgrounds are transformed into outdoor classrooms where campers explore the world around them in a relaxed atmosphere, participate in art activities and games, have a picnic snack, read a story in the shade of a tree and enjoy lots of water play. Country Day's air conditioned buildings provide a respite from summer heat and space to enjoy indoor activities and centers. Each classroom has a child-sized bathroom adjacent or nearby. An Art Studio, Science & Nature room, and Library are also on campus and available to our campers. The Camp CDS swim program is built into the daily schedule of campers in the Garden Group, Ocean Explorers, Weekly Wanderers, and Getting the Most Out of Play classes who are reliably toilet trained. Our swim instructors and certified lifeguards teach basic floats, kicks, and arm movements, and build confidence in the water. The program combines individual attention with group activity time in the pool. Each class combines structured instruction with free play in the pool, and Fridays bring a camper favorite "Fun Fridays" with games, pool noodles, and water toys. Our on-campus heated pool is ideal for young swimmers who may or may not have prior swimming experience. Low steps lead into the gently sloping pool allowing children to sit in the water, stand comfortably, or venture into deeper water with teacher supervision and assistance as appropriate for their level. Private lessons are also available by reservation before or after a camper's day for an additional fee. Camp CDS is a magical and nurturing experience for young children. Alumni cherish fond memories of pony rides, fun in the sun, animal encounters and lasting friendships– even into adulthood! Campers in 4 & 5 day programs have weekly music and science classes, exciting experiences such as pony rides, and classroom experiments and projects. Campers in the morning Garden Group, Ocean Explorers, and full day Weekly Wanderers participate in Camp Sing once per session. The children practice fun songs and class cheers to perform at a group sing along in our Hickory playground amphitheater. Parents and loved ones are invited to join us for a sing along the final week of each session. Campers during both sessions will be able to explore the beautiful grounds of the Country Day School campus. Our winding nature trail, butterfly garden, nine playgrounds, gazebo for stories, quiet places under old trees for cloud watching and enjoyment are just part of what CDS has to offer. Hardly a stone will go unturned as the campers search for the wonders of nature in a safe and nurturing environment. Our experienced teachers and counselors design outdoor learning and activity stations, as well as foster imaginative play and creative expression. Sightings of woodland animals like toads, our resident groundhogs, and even an occasional deer make for special moments in nature. For children younger than age 3 by 6/15/19 and a parent or caregiver. This once per week class for our youngest campers is held on Fridays for 2 hours. Our Director of Parent Education leads a parenting discussion for half the class tackling topics such as cognitive development, tantrums, facilitating newfound independence, and more. The other half the class session is time for parents to lead children in play modeled and facilitated by two teachers. For children age 3 by 9/30/19 (entering CDS 3s or equivalent in 2019-20). This program is offered Monday-Thursday either mornings or afternoons. These younger campers spend their days in a nurturing environment having lots of fun with outdoor exploration, water play, art projects, games , stories, and music. It is a great time to build independence, learn through play, and make new friends. The afternoon program is available for registration on a week-to-week basis, while the morning program is by full session only due to high demand. Maximum enrollment of 10 campers with 2 counselors in each of the 3 morning classes and in the afternoon class. For children age 4 by 9/30/19 (entering CDS 4s or equivalent in 2019-20). Our Garden Group campers spend their busy days swimming in our pool, challenging themselves on our playgrounds, learning new songs, and investigating natural attractions. Their days are rounded out with art projects, stories, music and more. This program is offered mornings Monday-Friday, and is by full session only, and ideal for children who benefit from maintaining a similar routine with children of their own age group. Maximum enrollment of 15 campers with 2 counselors. For children entering Kindergarten of 1st Grade. This program for our oldest campers embraces the best summer has to offer. Complete with pool time, music, stories, and playground fun, these campers engage in hands-on learning and complex projects. Past activities have included STEAM activities, cooking projects, creating books and field guides, and other projects inspired by the campers’ interests. The Ocean Explorers is offered Monday-Friday either mornings or afternoons by full session, with possibility of week to week enrollment in the afternoon class. Maximum enrollment of 16 campers with 2 counselors in both the morning and afternoon class. This mixed-age group program for children eligible for Garden Group or Ocean Explorers (age 4 by 9/30/19 through rising 1st graders) is available by the week or session to meet your family's schedule. The full day option runs Monday-Friday, and includes time for a lunch brought from home, and rest time daily. The part day option is offered Monday-Thursday and is ideal for children with a sibling in the Forest Friends, families who enjoy taking weekend trips, or otherwise would enjoy some camp time with friends as fits your needs. Maximum enrollment 15 children with 2 counselors in the morning and afternoon classes, and each of the 2 full day classes. Under the Sea, June 17-21. An ocean lover's dream, this week of camp includes projects based on the undersea world, learning about ocean life, and much more. Whether pretending to be in a submarine or swimming with mermaids, we'll dive deep into the imagination! Conservation Creations, week of June 24. Campers will focus on using recycled and natural materials to build structures, create masterpieces, and express themselves artistically. Projects incorporate STEAM concepts of early engineering, patterning, and creativity while instilling an appreciation for reducing our impact on the Earth by conserving materials which may otherwise be discarded. Red, White and Blueberries, week of July 1 (camp is closed July 4). Campers will celebrate Independence Day through stories, artwork, music, and cuisine. Children will have the chance to prepare, cook and taste different recipes that celebrate Americana. Great Outdoors, week of July 8. Our expansive grounds are the perfect backdrop for this week filled with outdoor exploration, days spent "camping" and making s'mores, and investigating the plants, insects and wildlife found on the playgrounds and in our region. Fun in the sun and mud, here we come! Playground Pirates, week of July 15. Campers become buccaneers who roam the grounds in search of treasure, draw maps where X marks the spot, and engage in imaginative play indoors and out. Dogwood playground becomes the seven seas as the children help transform the playground equipment into a ship, pirate's cove, and more. Animal Adventures, week of July 22. Children's natural interest in wild animals and different habitats will be the focus of this final week of camp. Our intrepid explorers will learn about different animals, go on scientific expeditions across the playgrounds, and enjoy a week of wild fun. A mixed-age class for children eligible for Garden Group or Ocean Explorers (age 4 by 9/30/19 through rising 1st graders). Taught by Dr. Rene Hackney, this play-based class reinforces a range of social skills such as entering ongoing play, managing emotions, and solving social conflicts. Children begin their afternoon with a lunch from home which allows time to socialize and go over the day's schedule, and also participate in swimming, music and science. Offered Monday-Friday afternoons by session or individual week. Maximum enrollment of 12 children with 2 counselors. This year we are offering both early morning and late day extended day options to help meet your family's needs. Early morning care is available as contracted to children enrolled in morning or full day programs, beginning at 7:45am and running through your child's camp class arrival carpool time. Late day care is available as contracted to children enrolled in afternoon or full day programs, beginning at your child's camp class dismissal carpool time and running through 5:00pm. Please note that all programs are subject to minimum enrollment in order to be offered, and are subject to change before contracts are issued. When can I register for camp? Priority registration opens for CDS families begins Monday, January 28, 2019, and opens to the general public after Friday, February 8, 2019. Registration is first come, first served, with a waiting list maintained as many programs do fill quickly. Please fill out our online registration form for each child attending. A non-refundable deposit, which will be counted toward your total camp payment, is also required and can be conveniently paid online. Once we have your registration and deposit, a signed copy of the contract we will send you along with full payment must be received by April 26th. All health forms, emergency and authorization forms, proof of identity, and applicable medication and allergy action forms are due by May 31st. What are the dates of Camp CDS? The first session of Camp CDS runs June 17-July 5 (there is no camp on July 4), and the second session runs July 8-26, 2019. Campers can enroll for one or both 3-week sessions, or by week in the Weekly Wanderers and afternoon classes. Does my child have to be a CDS student to attend Camp CDS? No, while we have many CDS students at camp, we welcome campers from a number of other area schools and children for whom this is their first experience in a camp or school setting. No, we welcome campers at whatever level of potty training they've attained. Each classroom has easy access to child-sized bathroom, most of which have changing tables. We do, however, require that children be reliably potty trained to enter the swimming pool; alternate arrangements will be made for any children during pool time as appropriate. Children in the Forest Friends and Terrific Toddlers classes do not go to the pool but may participate in water play regardless of potty training level. What makes Camp CDS unique? Unlike some other camps which employ an outside summer staff, the vast majority of our camp classes are staffed by experienced early childhood educators with experience at Country Day School, assisted by trained high school and college students. Our on-campus pool, designed for young children with steps and a gentle slope into shallow water, makes swim instruction safe and convenient, and allows for additional private lessons for those interested. Our numerous playgrounds provide a variety of physical challenges in the beauty of nature. Camp CDS offers a variety of class options to meet the different scheduling needs of our families, and provides memorable experiences like Camp Sing, pony rides, and much more! We strive to continue the safe, nurturing environment which is a hallmark of Country Day School throughout Camp CDS. What is a typical day like at Camp CDS? Every class is different based on their schedule of enrichments, age and focus of the program, and the interests of the campers. All children arrive at their designated 10 minute carpool window and transition into their camp day. A typical day for a part day program might begin with playground time, followed by swimming or water play, after which children change into dry clothes and enjoy a camp-provided snack together. Each day incorporates either indoor or outdoor learning and play centers which include art projects, age appropriate toys and blocks, dramatic play, and more. Programs tend to end their day with a story and songs before their 10 minute departure carpool window. Children in 4- or 5-day programs also have weekly music classes and special activity times such as pony rides or moon bounce, and may include Camp Sing and/or science classes as well. Children staying for a full day classes also enjoy a lunch brought from home and a rest time at midday. My child has allergies, can Camp CDS accommodate our family? Camp CDS is an allergy aware program and we make every effort to safeguard children with allergies. Snacks provided by Camp CDS are nut-free, and children's lunches brought from home may not contain nut products. In the case of other life-threatening allergies we may ask parents to refrain from sending certain items, as well. All camp staff are trained in CPR, first aid, and administering emergency medications including epinephrine auto-injectors (ex. EpiPen). Children with allergies that require emergency medication kept on hand must have an Allergy Action & Medication Release Form on file and provide the medication in its original box with prescription label if applicable. Please note that our campus does have several nut trees on the grounds. Where can I locate information about camp fees? Our camp program prices are listed on the fees page. My family travel plans overlap with one of the camp sessions, can I get a reduced rate for our absence? Unfortunately we cannot offer reduced fees for absences in camp programs offered by the session. Our Weekly Wanderers and afternoon classes are, however, offered either by session or by individual week and offer more flexibility for a busy schedule. My child has only ever attend morning programs, what can you tell me about your afternoon program options? Our afternoon programs provide campers with the same general schedule as the morning part-day programs, but with a focus unique to the afternoon classes and with the added benefit of being available by the week for those with summer travel plans. The Getting the Most Out of Play class begins with a lunch time together during which children and teachers can share stories from the day, discuss the afternoon schedule, and enjoy a packed lunch from home. Afternoons at Camp CDS tend to have fewer children on campus and thus allow for camp classes to roam the playgrounds and have the freedom to undertake larger-scale projects in unoccupied classrooms. Water play and swimming seem even more appealing under the afternoon sun. An afternoon program can also be a great option for children transitioning to a full day or afternoon program in the coming school year as it allows children a change to adjust to a new schedule in a relaxing environment. Each classroom has a cozy corner and our playgrounds have shady spots if a child who is growing out of nap time needs a place to rest. Many families also find that avoiding the morning rush is a nice choice, as well! How do I sign my child up for private swim lessons? An email with more information will go out to registered families closer to the start of Camp CDS. Private lessons are available for an additional fee per class Monday through Thursday after morning classes depart, before afternoon classes arrive, and at the end of the camp day. Swim lessons open to all campers who are reliably toilet trained. Individual swim lessons can be arranged for one or more lessons per week, and are scheduled through our Pool Manager directly. Do you offer extended day in the summer? We offer early morning and late day care for an extra fee. Early extended care begins at 7:45am for children enrolled in morning or full day classes, and late day extended care is available until 5:00pm for children enrolled in afternoon and full day camp classes. If you are interested in this option please indicate so on your registration form. Please note that extended care programs are dependent upon reaching a minimum enrollment. How can I register for a full day of camp? We have a full day class option for children age 4 by 9/30/19 through entering 1st grade. Our Weekly Wanderers class is a full day class in which students stay with the same teachers and peers, for the day. We do not offer a full day option for children younger than age 4 by 9/30/18 at this time. We have discontinued the possibility of combining a separate morning and afternoon program for campers as we found this to create repetition and a few too many transitions for young children, so with the best interest of the children in mind no longer offer this option. Additional questions? Contact the CDS Camp Office at 703-356-9165 or camp@countryday.org. As part of the Country Day community, you are invited to attend the evening parenting series workshops facilitated by Dr. Rene Hackney, CDS Director of Parent Education. These free workshops are held in room C203 on Tuesdays nights from 7:00-9:00pm, or Saturdays as noted. We hope that you will have an opportunity to attend one or all of Rene's workshops. Summer 2018 topics are listed below. Too hot outside? Dance party break! CDS may have been founded in the '60s, but (like the temperature today) our dance moves are stuck in the '90s during a Wiggly Worm class dance party. Check out our rising 4s showing off their coordination, motor skills and memory for the classic "Macarena'"moves. Read more about Too hot outside? Dance party break! View a splashy moment in action from the Dolphin class at Camp CDS!